To detoxicate and enhance liver functions. No one knows for sure where it comes from, Europe or Asia, but this very important perennial plant has been cultivated and utilized in the most ancient continent supposedly for many millennia. - Vitamins (A, C, H) and folic acid. - Minerals Ca, P, Fe, Na, K, Sn, Si, Mo (Calcium, Phosphorus, Iron, Sodium, Potassium, Tin, Silicone, Molybdenum). 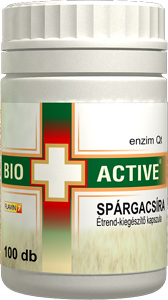 - It contains high amounts of asparagine, which is able to restore acid-alkalic balance of the blood. - Its most important effect is to purify uriniferous tubules. - It dissolves and prevents further deposits of lithic acid in the kidneys, preventing formation of chronic nephritis this way. - Asparagus-germs might be a solution to the concomitant sign of kidney disorders: oedematic limbs. - They migh mitigate rheumatic pains or gout, their continuous use can even stop them. Storage: in a dry and cool place. Keep out of reach of children!